THE Chili recipe around here. Three kinds of beans + onions, green peppers, fire-roasted tomatoes, and spices bubble in the Crock Pot while you go about your day. Ground beef can go in the carnivores’ portions if you like. 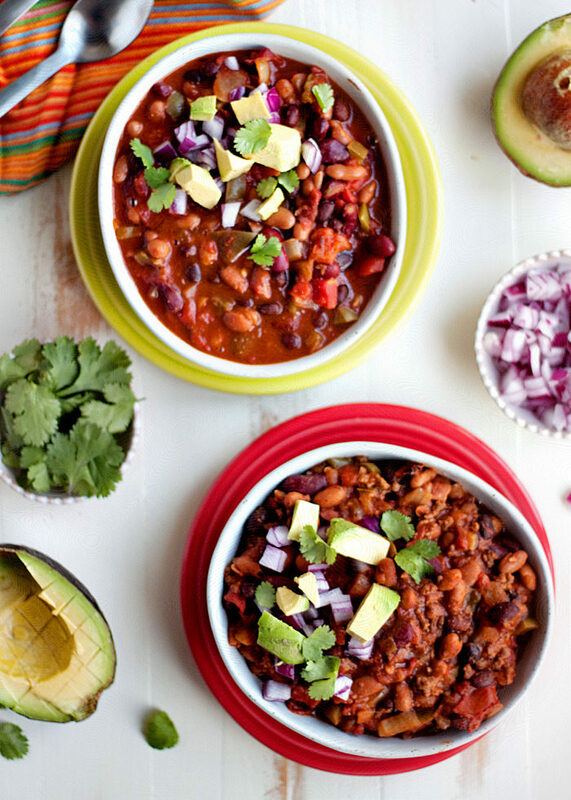 Chili two ways=a happy home! 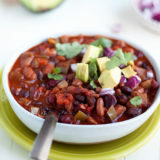 I originally posted this easy chili recipe on March 29, 2012. It’s continued to be a mainstay around here. We made it again for a crowd this past weekend and I decided it was time to update the photos and add a few notes to the recipe. We still love it as much as we did when I first shared it, and we hope you do too! I’ve tried many, many variations of chili over the years. 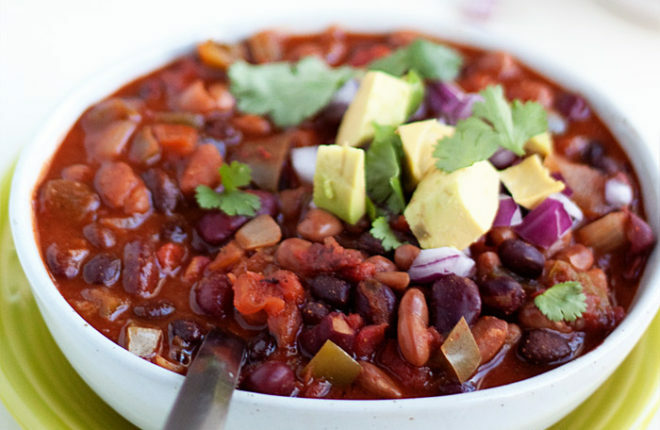 Super simple chili, chili with a gazillion ingredients, chili with “secret ingredients” like unsweetened cocoa or brewed coffee (both very good, actually). 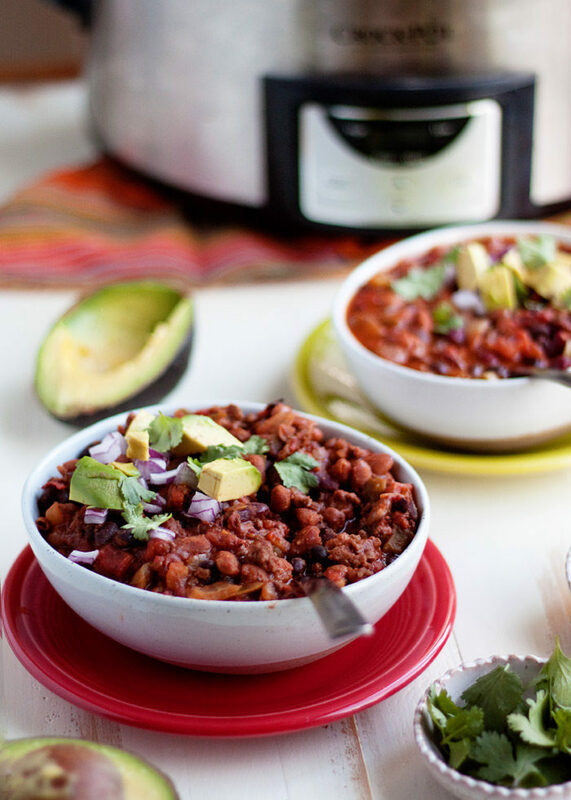 But this slow cooker chili recipe is the one that’s been floating around on a piece of paper with the title of “THE Chili.” My guy took a bite of his version (with meat) and said, “This is it. You can stop at this one. It’s perfect.” I feel the same way about the vegan version. 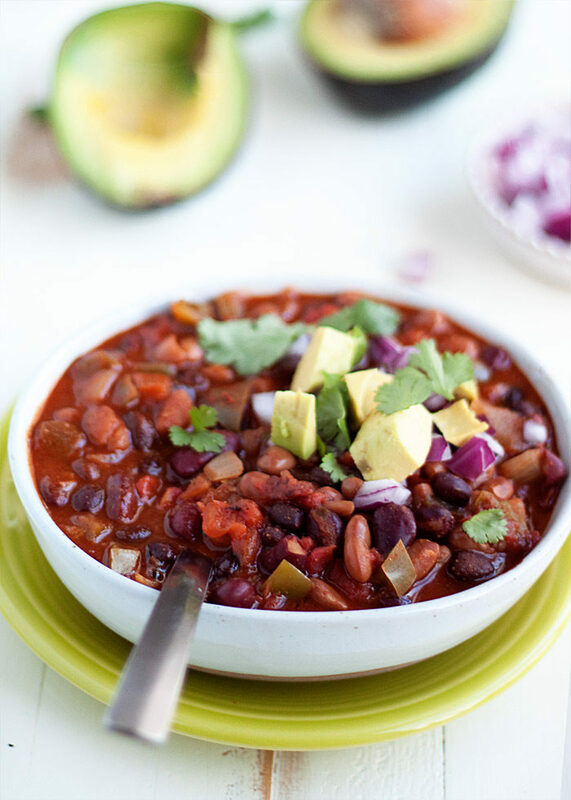 The bonus is that this Slow-Cooker Easy 3-Bean Vegetarian Chili is super simple to throw together, and takes next to no work to cook. It bubbles in the Crock Pot all day, simmering to dinnertime perfection. If you’re okay with the vegan version, it’s done when you get home. If you want it one-dish-two-ways style, just brown the ground beef, simmer some of the chili together with the meat for a bit, and dinner’s ready. 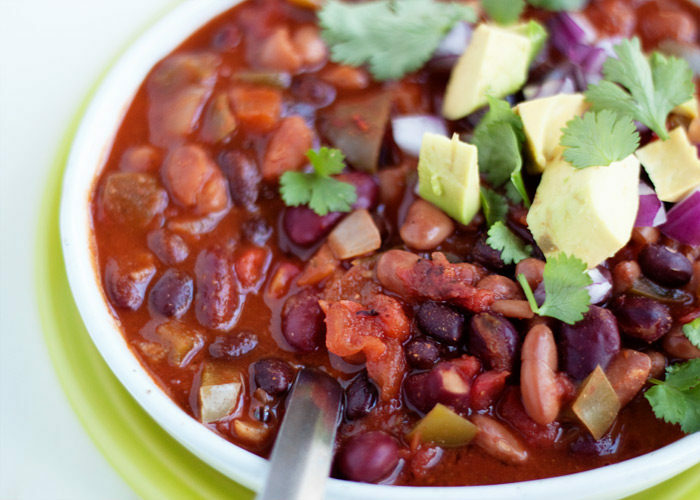 As-is without the Tabasco, this is a nice, mild, family-friendly chili – not much heat at all. Add the Tabasco at the end, offer it up as a topping, or omit it altogether, depending on your preferences. This chili freezes really well. I scoop leftovers into freezer bags, label, and stick in the freezer for super-easy future meals or even to top nachos. Double the recipe to ensure lots of extra – just make sure you’re using a big Crock Pot! In a medium or large saucepan, brown the ground beef over medium heat with a little salt and pepper for flavor, if you wish. Drain off any fat. Add five cups of the chili to the browned ground beef. Stir, continuing the medium heat, and heat until boiling. Reduce heat to low and simmer for 20 – 30 minutes. In a medium or large saucepan, brown the ground beef over medium heat with a little salt and pepper for flavor, if you wish. Drain off any fat. Add to the chili in the Crock Pot either at the beginning of the cooking process or near the end. Serve with assorted toppings such as diced avocado, fresh cilantro, chopped onions, sour cream (or vegan sour cream), grated cheddar or jack cheese (or vegan cheese), and some Tabasco or Tapatio sauce. Made this recipe and got rave reviews from my daughter’s basketball coaches and team. I made one minor modification because I did not have all the ingredients. I substituted one can of roasted tomatoes, 1 medium onion, and tabasco sauce with one 16-ounce jar of Herdez Casera salsa. Thank you for posting! What if I added some cubes of steak at the beginning? I’m sure that would be great! I’ve not made it that way, but it’s a very versatile chili. I’d think it’d be nice if you quickly browned the steak with a little salt and pepper before you put it in the Crock Pot with everything else. If you try it please come back and let us know how it turned out! Was fantastic! I made it tonight and I used Boca Crumbles, and used Siracha Sauce instead of Tabasco. Can’t wait to make this! Do you think I could cook it on high for 4 hours in a pinch? The recipe calls for 2 cans of chili in sauce. So is this already made chili beans like Nalley’s chili or chili beans that are not drained? Thank you so much Karen I really appreciate the help. I’m going to make this tomorrow along with some cornbread, yum!! I’m getting this ready for the crockpot now to serve for 40 tomorrow. Does it not require extra liquid? I’m a novice crockpot user, but it seems like most recipes add water? Thank you! Hi Jeni, no extra liquid needed! Slow cooker recipes require much less liquid because it doesn’t evaporate. I love how bright and vibrant this chili is! This is exactly what I was searching for. I have to make chili for vegan and meat eaters and I wanted a slow cooker version of it so I can start it tonight. I may put a little red wine in this (I’ve made beef chili before with red wine or beer added). Then I am going to try to add some sauteed ground beef and maybe some sausage to half of it around a half hour or so before serving. I’ll let you know how it turns out. So good! Ive been looking for the perfect chili and this is it! I’m confused about the 3 beans though. Are chili beans not kidney beans? Oh, I did use crushed tomatoes instead and about 10 splashes of cholula instead of Tabasco sauce. Perfection! Can I completely double the recipe to feed a larger crowd? Its a 5 qt cooker. Excellent, versatile recipe! I wondered at there being no added salt or pepper in the recipe, then read the fire roast tomatoes can label and realized it was already in. No lack of flavour here! Added a soy ground beef replacement at the end and roasted peppers we had in the freezer with good results as well. Very tasty. No meat required. Full disclosure: I tried adding a little ground chipotle peppers, which was okay but probably not necessary. Also, the chili turned out just a bit thin, so maybe I was supposed to drain the tomatoes. I don’t know. Regardless, it was great and I will make it again. Thank you for sharing! I made this chili today, and it was awesome! Thanks so much for sharing it. Authentic Southwestern Chili has NO BEANS of any kind !!! Never !!! The first recipe for chili con carne was put on paper in the 17th century by a nun, Sister Mary of Agreda of Spain. She was mysteriously known to the Indians of the Southwest United States as “La Dama de Azul,” the lady in blue. It is said that Sister Mary wrote down the recipe for chili which called for venison or antelope meat, onions, tomatoes, and chile peppers. On March 9, 1731, a group of sixteen families (56 persons) arrived from the Canary Islands at Bexar, the villa of San Fernando de Bexar, now know as the city of San Antonio. They had emigrated to Texas from the Spanish Canary Islands by order of King Philip V. of Spain.The King of Spain felt that colonization would help cement Spanish claims to the region and block France’s westward expansion from Louisiana. These families founded San Antonio’s first civil government which became the first municipality in the Spanish province of Texas. According to historians, the women of San Antonia using the recipe of Sister Mary made the spicy stew that is known as authentic Southwestern Chili. consistency). The “prisoner’s plight” became a status symbol of the Texas prisons and the inmates used to rate jails on the quality of their chili. The Texas prison system made such good chili that freed inmates often wrote for the recipe, saying what they missed most after leaving was a really good bowl of chili. the army and navy. In 1884, he organized a venture with the Range Canning Company at Fort McKavett, Texas to make chili from goat meat. Tobin’s death, a few days after the canning operation had started, ended further development and the venture failed. The Texas chili went national when Texas set up a San Antonio Chili Stand at the 1893 Columbian Exposition in Chicago. Lyman T. Davis of Corsicana, Texas made chili that he sold from the back of a wagon for five cents a bowl with all the crackers you wanted. He later opened a meat market where he sold his chili in brick form, using the brand name of Lyman’s Famous Home Made Chili. In 1921, he started to can chili in the back of his market and named it after his pet wolf, Kaiser Bill and called it Wolf Brand Chili (a picture of the wolf is still used on the label today). In 1924, Davis quit the chili business when his ranch was found to have lots of oil. He sold his operations to J. C. West and Fred Slauson, two Corsicana businessmen. To draw attention to the Wolf Brand Chili, the new owners had Model T Ford trucks with cabs shaped like chili cans and painted to resemble the Wolf Brand label. A live wolf was caged in the back of each truck. Today the company is owned by Stokley-Van Camp in Dallas,Texas. In National Chili Cookoff Competion Contests , NO BEANS in the Chili !!! Beans ! Beans are a side dish served with Cornbread. This recipe is not a history lesson claiming exact authenticity. You must only eat bean-less chili made with antelope and venison then, because anything else would inauthentic. Regardless of the type of Meat one chooses to use in the making of Chili , My Point was that BEANS were not used in the Authentic Southwestern Texas Style Chili !!! EVER !!! I don’t care if one uses Possum Meat or whatever , BEANS are NOT used in Chili just like I stated in the above posting !!! Neither are Celery or Carrots or Corn !!! Excellent recipe and base for other chili recipes. I’ve used this and made some alterations to GREAT result. And I’m sure I speak for many others here in response to Bear when I say…”I DON’T CARE!! !” Cool story bro, but I’m from the Midwest and we put beans in our chili and it’s delicious. Thanks to Kare for the original recipe and inspiration! I selected this recipe over many others because it easily adapts to my mixed omnivore and vegetarian family needs. This a rare find. Looking forward to getting more flexible recipes from your emails.